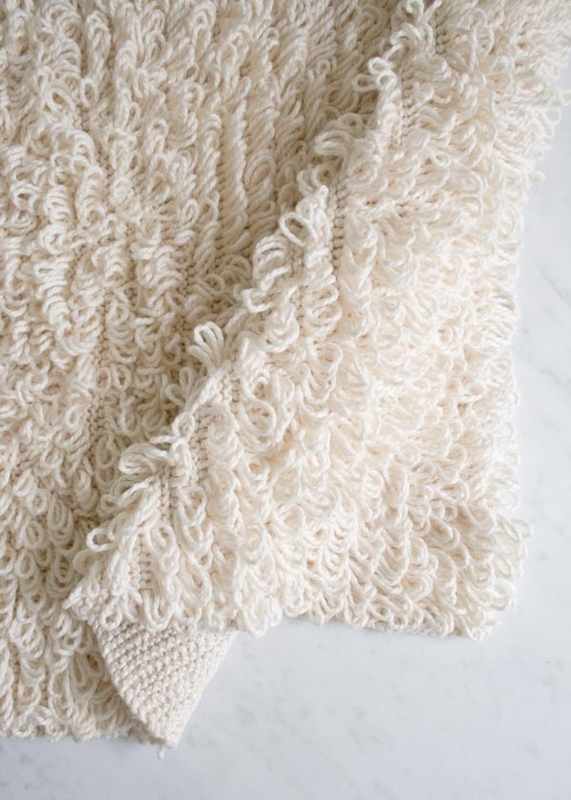 If you’re a knitter, you’ve probably outfitted your extremities, plus those of everyone in your immediate family, and you’ve most likely also supplied a few babies with handknit blankets. All worthy and satisfying endeavors, but have you ever knit a deep, soft, plush landing pad for your wet feet? No? Well, why not? 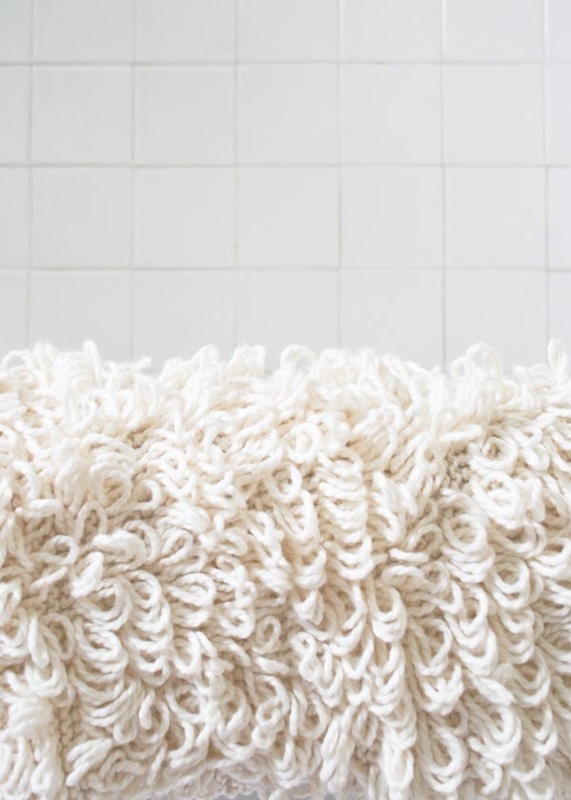 Admittedly, our Loopy Bath Mat is a bit on the whimsical side with its rambunctious texture and well… its handknit-edness. On the other hand, if a bath or a shower is an exercise in self-care, then this hedonic bath mat is the perfect equipment! 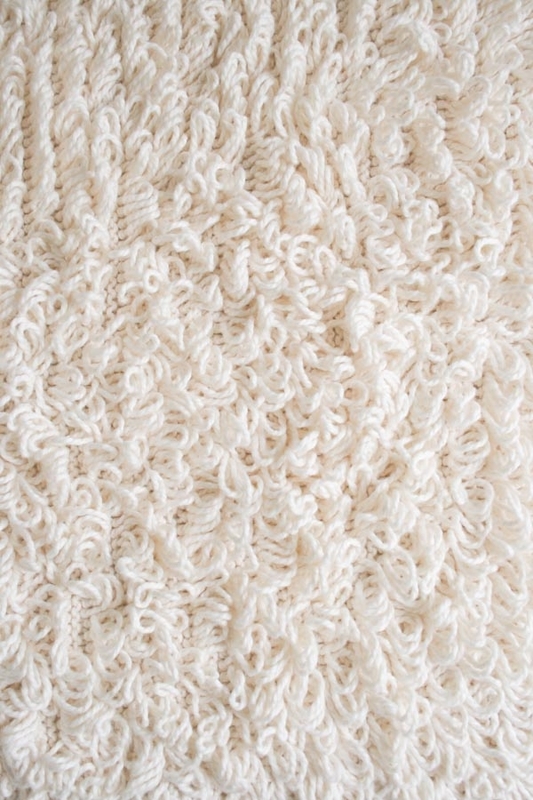 How did this Loopy Bath Mat get so soft and decadent? First, with the invaluable aid of Blue Sky’s Worsted Cotton, the coziest cotton we know; and second, with the creation of big loopity loops! 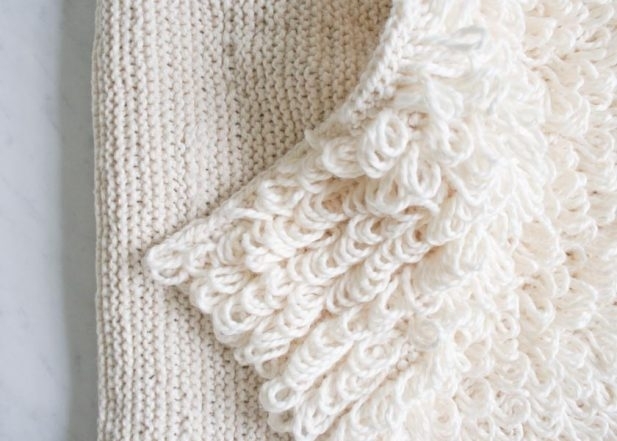 The Loop Stitch is one of knitting’s most adventurous stitches, involving fingers that normally idle and methods that truly surprise. 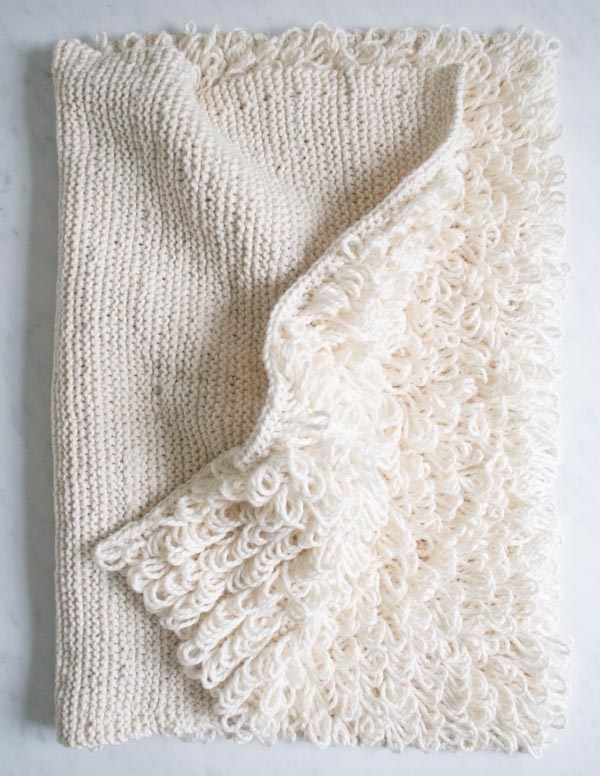 And with just one pattern row for every five garter stitch rows, it’s unexpectedly easy too! 5 skeins of Blue Sky’s Worsted Cotton, 100% cotton. I used the color Bone. 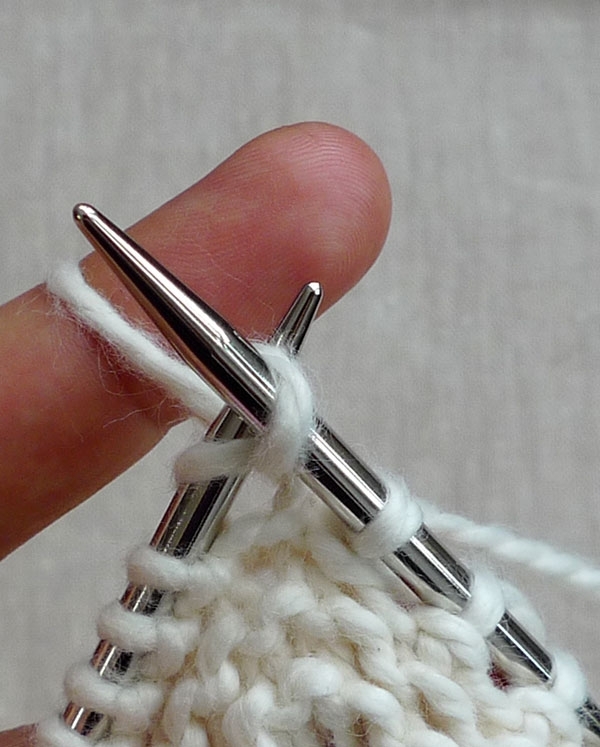 Wrap the working yarn around the middle finger as you knit the next stitch. Do not allow the stitch to fall off the left needle, so that you have a new stitch on the right needle and the old stitch on the left needle. 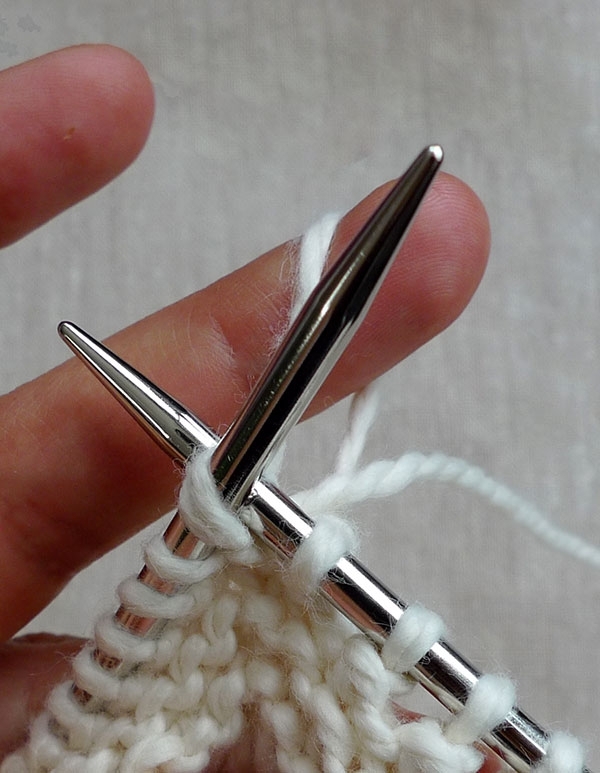 Step 2: With your middle finger still in place, slip the new stitch from the right needle to the left needle. 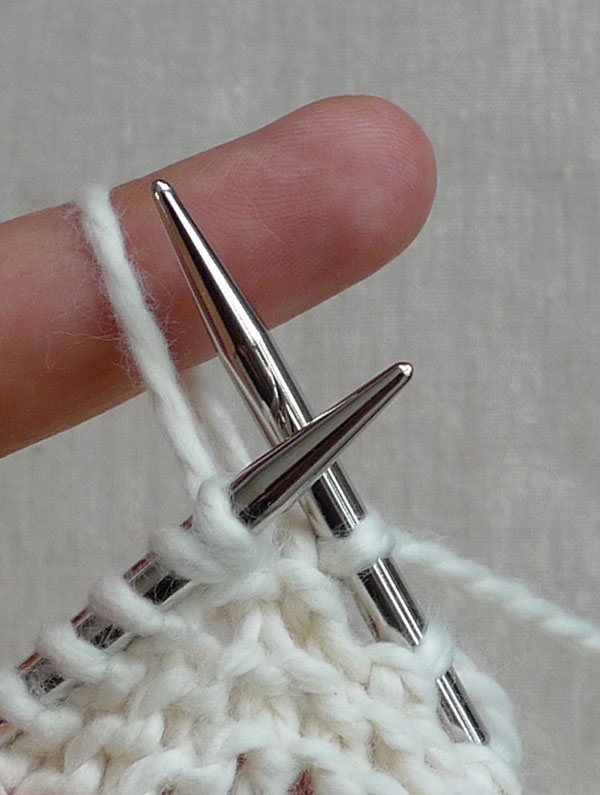 There are now two stitches on the left needle and your middle finger is still holding a loop of yarn. Step 3: Knit those two stitches together through the back loop. 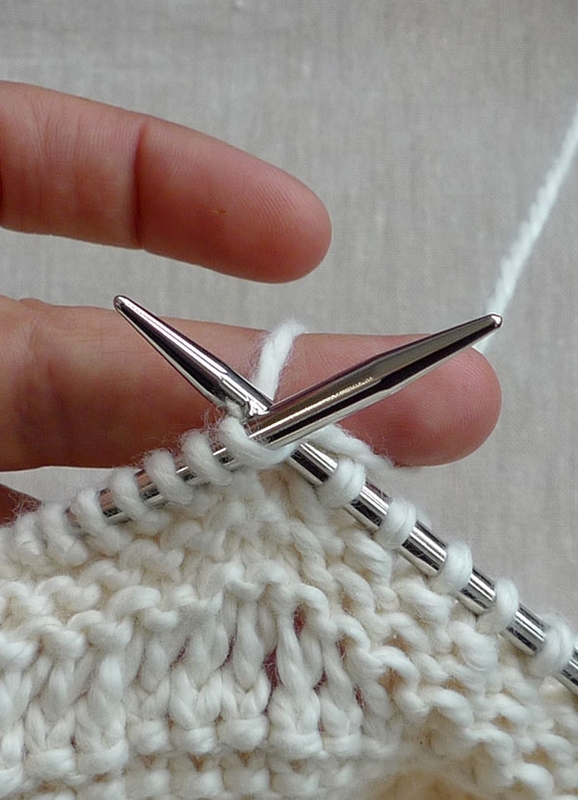 Allow both stitches off the left needle and release your middle finger, giving the loop a tug as you do. Row 6: K3, knit into the back loop of each stitch to the last 3 stitches, k3. Repeat Rows 1-6 until piece measures 27 1/2 inches from the cast on edge, ending with Row 6. Next Row (right side): Bind off loosely in knit stitch. Weave in the ends and take a bath! CARE NOTE: Blue Sky’s Worsted Cotton is machine washable, but like all handknits, I’d recommend hand washing your bath mat. Just soak it in warm water with a gentle soap, rinse and squeeze. Lay your mat flat on a dry towel and let it dry! Another simple, creative, beautiful piece of art. I love this site! The patterns are simple and the end result is amazing. I've used some of the patterns for hats and elbow pads for a sweater that had some wear and things always turn out great. Thanks for the site. I made the loops and found them too large for my liking. Do you have a knitting method or making smaller loops? I definately would love to try this! That`s lovely! I want to make one. Thank you very much for sharing. You might want to try wrapping the working yarn around an extra knitting needle that would create the size loops you'd like. 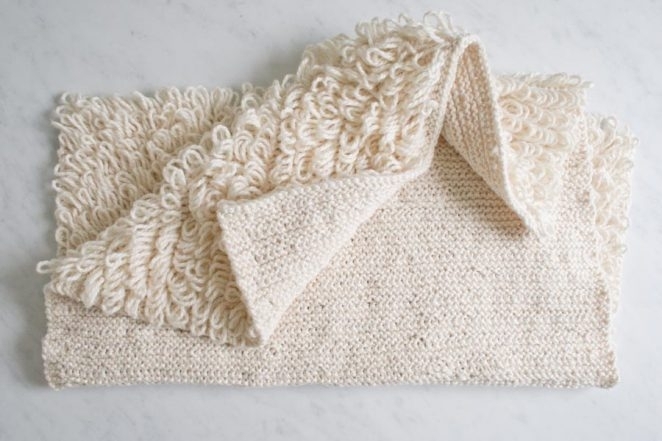 You can wrap the yarn around anything, really. The idea is simply to create consistently sized loops. Thanks so much for asking and let us know how it goes! 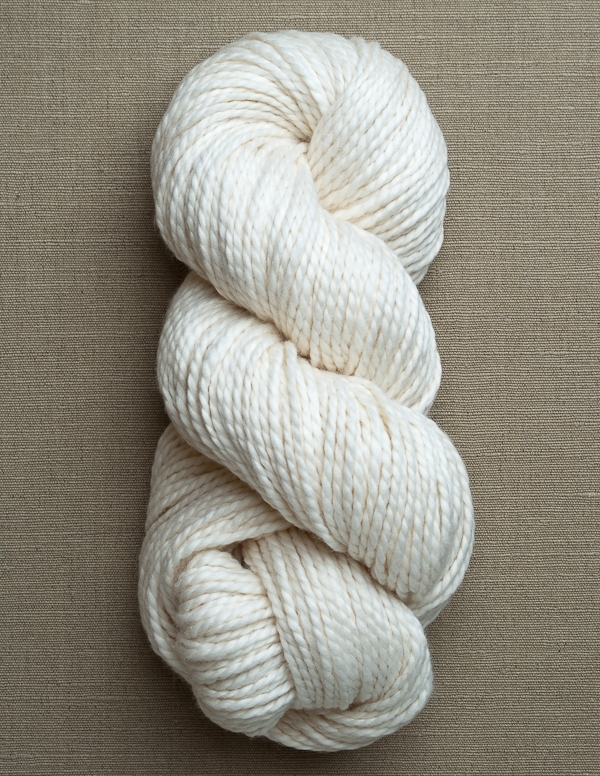 I have some linen yarn just waiting for a project. I think I may give it a try. This looks like a fun project! 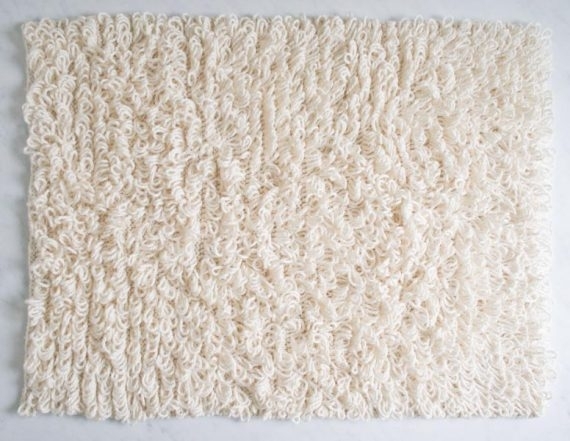 I don't need a bath mat, but I'd love to try it for a whimsical scarf or hat. You've inspired me for sure! I'm a beginner crocheter. 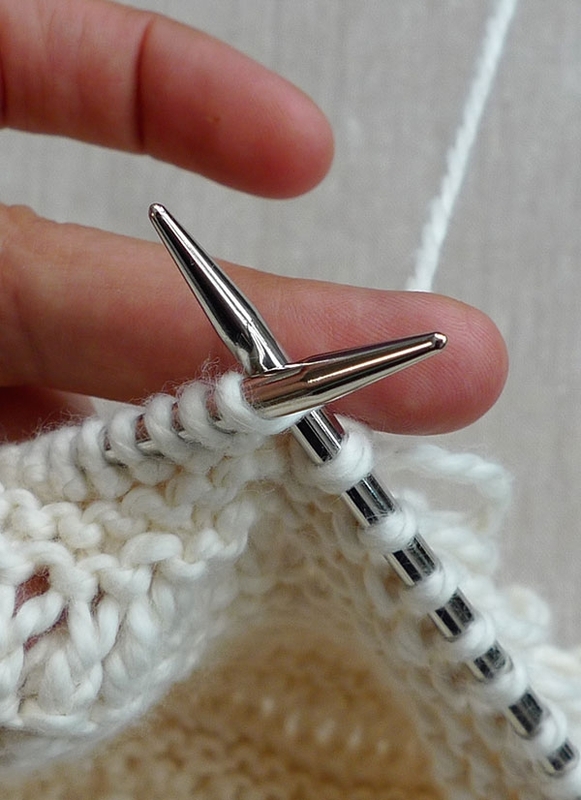 Would you be able to give instructions on how to do it with a crochet hook? If I wanted to make this bigger in length how many more stitches could I add or would it matter ? Please let me rephrase that last comment .how many more stitches do I add for making the width wider ? A Google search of "loop stitch for continental knitters" brought up a few video tutorials. I hope one of them helps get you on the right path! Spoiler alert: It looks like you'll be using the thumb of your left hand! Thanks so much for asking and please let us know how it goes! This stitch pattern works over any number of stitches, so you can add as many as you'd like! If you're getting the same gauge as I did (16 3/4 stitches = 4 inches), then you'd add 17 stitches to add about 4 inches of width. Please let us know if you have any other questions and thanks for this one! I've never crocheted a Loop Stitch, but a computer search of "loop stitch crochet" turned up lots of tutorials. I hope one of them helps! Let us know how it goes and thank you so much for your question! 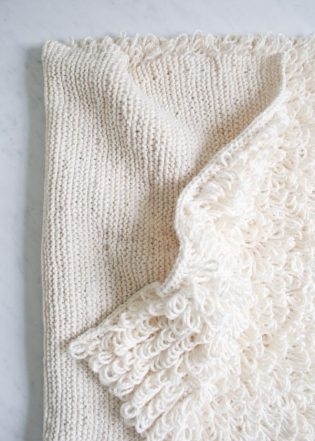 I would love to use this method for the inside of a jacket! I just tried the loop stitch for the first time and I might be confused. Are the loops supposed to be between two stitches or tied off of one? I have found tutorials on how it’s one loop for each stitch, but my method had a loop between two (like a rainbow?). Not sure if I’m doing it right! The loop should seem like it’s coming from two stitches together, almost like it’s tying two stitches together. Our tutorial at the beginning of the pattern explains the technique we used to make our loops. I’m sure there are other ways, but if you follow our steps you should get loops that look like ours! Please let us know if you need more guidance and thank you so much for getting in touch! Hi! I’m wondering after my first attempt if the loops are supposed to be closed or open after you’re done? Mine are open between two stitches so I’m not sure if I’m doing it correctly! 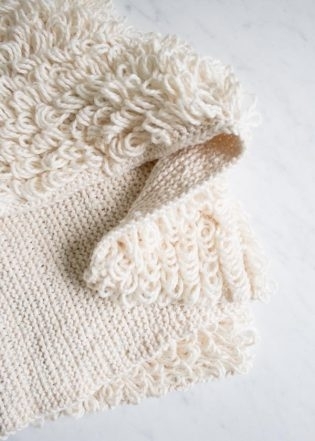 The loop is “open”, meaning that its doesn’t connect to the knitting at the same exact point. And in terms of “doing it correctly”, if you’re not doing it already, I would start out with a gauge swatch and work Rows 1-6 several times. 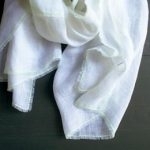 You should, at that point, get the sense of whether you’re doing the stitch right or not. Does it look like our photos? Does it feel right? Most importantly, do you like it? If the answer is no to those questions, take an extra careful look at our tutorial to see where you might be going wrong. And, as always, we’re happy to help! Thanks again for your questions. Keep them coming! If you included international (metric) needle sizes with your patterns that would be super-great. This looks like a really fun pattern. Off to find out what US#7 means…. Hello, I try to make a loop stitch. Your making is so beautiful, but I do not know step3. What are those two stitches? If you don’t mind, please let me see your technique with Video. Thank you for your message and our apologies for the greatly delayed response. At present we are unable to make a video for this technique. However, a Google search of “knit loop stitch” brought up a few video tutorials. I hope one of them helps get you on the right path! Does this bathmat slip on the tile floor? Any recommendations for how to create a sticky backing that will prevent it from slip sliding away? Thanks in advance for your ideas. Thanks so much for writing in! The yarn used for this is cotton and I actually can’t think of a yarn that would be sticky and slip resistant. I suggest that you hand sew a “rug gripper” to the bottom of the mat when you are finished with it. 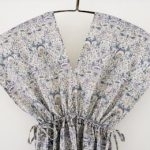 You can cut away the excess when you are finished sewing it. This should make your mat slip resistant. Best of luck on this project! It’s fun! I’m having trouble while doing Row 6 – when I try to knit through the back loop, the loops made in the previous row seem to be coming loose. What am I doing wrong? I love this mat and hope you will love yours too! Be sure that you passed your stitch on to the left-hand needle and that you knit this stitch with the original stitch through the back loop. This technique secures the loop in place. Let me know if this fixes it. If not, I’d be glad to help more!